Dylan Strome knew it was something he would have to fight through by himself. The third pick in the 2015 draft by the Arizona Coyotes — selected on the heels of Connor McDavid and Jack Eichel, and one spot before Mitch Marner — was struggling mightily to find traction in the NHL. As his contemporaries excelled early in their careers, Strome was returned to junior twice and spent more than half of last season in the AHL. Coming into 2018-19, the centre had registered four goals and six assists in just 28 career NHL games. Strome and the word "bust" were increasingly uttered in the same sentence. And to make matters worse, the conversations with those closest to him away from the rink were of little help. "It's kind of hard," Strome said. "No one really wants to tell you the truth when you're going through those kinds of times. "You just deal with it yourself, whatever way you can." 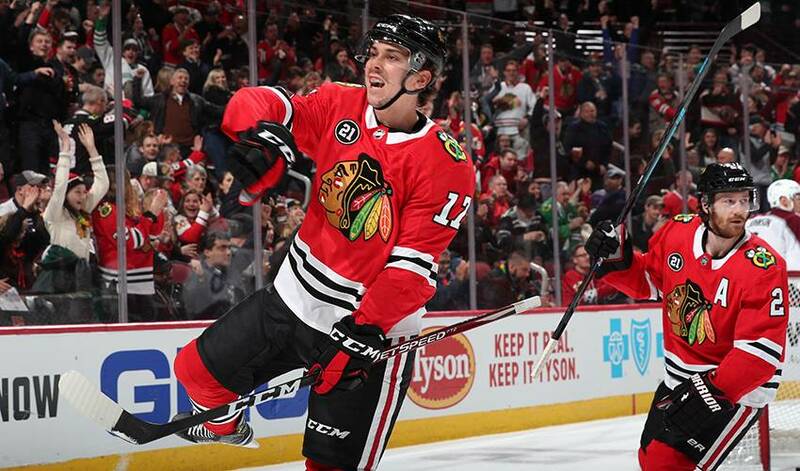 But as he did his best to not let the frustration and disappointment gnaw at him, everything changed in late November when Arizona dealt Strome and winger Brendan Perlini to the Chicago Blackhawks for centre Nick Schmaltz in a swap of three former first-round picks. After collecting three goals and three assists in 20 games with the Coyotes this season, Strome has exploded since the move with 44 points (14 goals, 30 assists) in 48 games. "It kind of came out of nowhere," Strome said of the trade when the Blackhawks were in Toronto last week. "It was a shock." While it's easy to look back and second-guess draft decisions nearly four years later, Strome's numbers and pedigree coming out of junior were eye-popping. McDavid's teammate with the OHL's Erie Otters for two seasons, Strome had 354 points (114 goals, 240 assists) in 219 regular-season games over his four campaigns to go along with 86 points (37 goals, 49 assists) in 69 playoff appearances. The six-foot-three, 200-pound native of Mississauga, Ont. — who was also picked ahead of Mikko Rantanen and Mathew Barzal in the NHL draft — added seven goals and four assists in five games at the 2017 Memorial Cup after captaining Canada's silver-medal winning team at the world junior hockey championship. Strome wasn't prepared for failure, especially on a personal level, at the start of his NHL career. "You read that stuff and you see that stuff," Strome said of the negative headlines. "It's something I never had to deal with before. You've got to block it out as much as possible. A lot of those things went away when I went to Chicago. "People stopped talking about where I was drafted — a high pick, stuff like that — and I just kind of played hockey." Strome, who was reunited with junior teammate Alex DeBrincat and Perlini on a line with the Blackhawks, plays on the top power-play unit with Patrick Kane and Jonathan Toews and has seen his average ice time bumped up nearly four minutes a game. "He's certainly (got) raw ability," said Chicago head coach Jeremy Colliton, whose team sat four points back of Strome's old club, the surprising Coyotes, for second wild-card spot in the Western Conference heading into Tuesday's action. "He's done a great job of producing for us. Defensively he's taken some strides. If he can do that, then the sky's the limit." Strome, whose older brother Ryan plays for the New York Rangers, compiled 16 points in his 48 games over parts of three seasons in Arizona. He has 44 points in 48 games with Chicago. "Opportunity," Dylan Strome said when asked of the biggest difference between the desert and the Windy City. "You get an extra seven, eight shifts a game, usually you can make something happen. "For whatever reason it didn't work (with the Coyotes). Everything happens for a reason." Toews, the No. 3 pick in 2006, said sometimes a change of scenery is what's needed. "There's probably a lot of great young players in this league that you haven't heard from yet that are maybe not getting their opportunity," Toews said. "As soon as (Strome) got here he was a great fit." DeBrincat, who had the same billet family as Strome in Erie, would chat with his old teammate when things looked bleak in Arizona. "We talked every once in a while ... not so much about hockey, but life in general," said the 21-year-old DeBrincat, who has 38 goals and 33 assists in 72 games this season. "He just needed that chance." It's a chance Strome doesn't plan on wasting after some difficult times. "It weighs on you a little bit, but I'm having fun now," Strome said. "A lot of good things have happened since the trade. "I'm just trying to build off that and hopefully I can keep going."